While nowadays we are no longer startled when we hear the words “paperless society” roll off the tongue of a techie, most of us still can’t conceive of a world without paper. It is to communication and knowledge what air is to breathing and life. 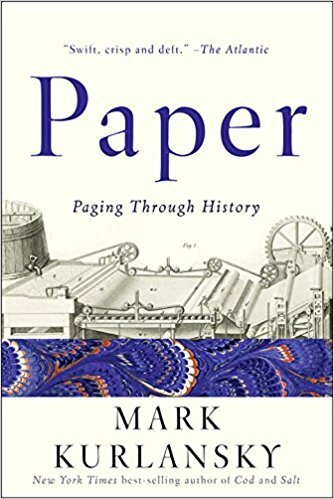 As stated in a New York Times review, “The history of paper is the history of cultural transmission,” and in his book Paper, author Mark Kurlansky tells its story in a lively and fast-moving way. He is as adept at explaining technologies as he is at humanizing a story, such as describing the rituals and diets that papermakers had to provide their workers as papermaking gained steam and encircled the globe. He has a sharp eye for the curious, be they Chinese oracle bones or Mexican amate, the bark-based writing material, not a true paper, on which the Aztecs wrote their glyphs, although there is evidence they may have produced paper too, from agave. Kurlansky is the author of the account of Salt that the book club enjoyed some time ago. Paper is a quick read. The book to follow it, for January, will be Genghis Khan and the Quest for God: How the World’s Greatest Conqueror Gave Us Religious Freedom by Jack Weatherford. This book is not a fast read, but will fascinate us all.